(b. 1946) – a Polish poet, translator, essayist, literary scholar and university lecturer. He specialises in the history of English and American literature, and literary theory. He is also a translator from English (Wendell Berry, William Blake, Allen Ginsberg, Seamus Heaney, Robinson Jeffers, Thomas Merton, Jerome Rothenberg; he also translated texts by John Lennon, Jim Morrison and Peter Sinfield). 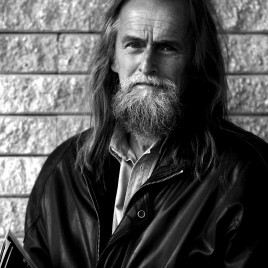 He is a member of the Literary Arts Committee of the Polish Academy of Sciences. A regular columnist of Tygodnik Powszechny, he has also published texts in magazines and newspapers such as: Brulion, Gazeta Wyborcza, Odra, Res Publica Nowa. He has collaborated with double bass player and music composer Bogdan Mizerski for over 25 years. He is the author and co-author of books such as: Maszyna do pisania. O dekonstruktywistycznej teorii Jacquesa Derridy [The Type/Writer. On Jacques Derrida’s Deconstructivist Theory, 1992], U-bywać. Człowiek, świat, przyjaźń w twórczości Williama Blake’a [Dr. Be-little. William Blake and the Ideas of Man, World and Friendship, 2001], Antygona w świecie korporacji. Rozważania o uniwersytecie i czasach obecnych [Antigone in the Corporate World. Reflections on the University and the Present Time, 2002], Żaglowiec, czyli przeciw swojskości [A Tall Ship, or, Against the Home(l)y, 2006], Ujmować. Henry David Thoreau i wspólnota świata [Grasping. Henry David Thoreau and the Community of the World, 2009], Oikologia. Nauka o domu [Oikology. Knowledge about Home, 2013], U-chodzić (2015).